We went straight out after dinner the first evening to the home pool. I could see the char waking on the river, this was like seeing it was raining on a part of the river where they came up, there were so many of them. 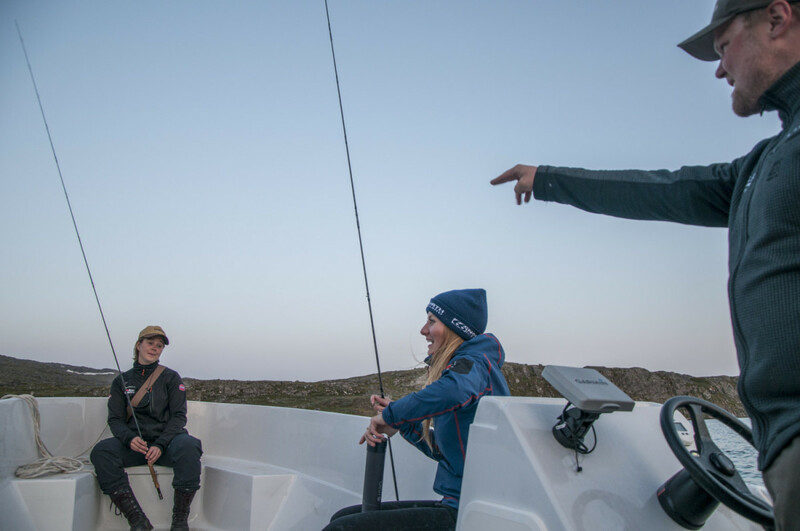 I started casting and BAHM…there it was.. My first Greenlandic char was on and it was fighting hard, this is a big one I said proudly and surely nodding to my cousin, in a teaching kind of a way, as she is not fishing much. Up it comes, it was not as big as I thought at all… I was surprised how strong it was comparing to its size as normally they are not this strong and hard fighters. There must be something in the water in Greenland, I thought and kept going. That hour I landed around 20 char and lost a lot too. 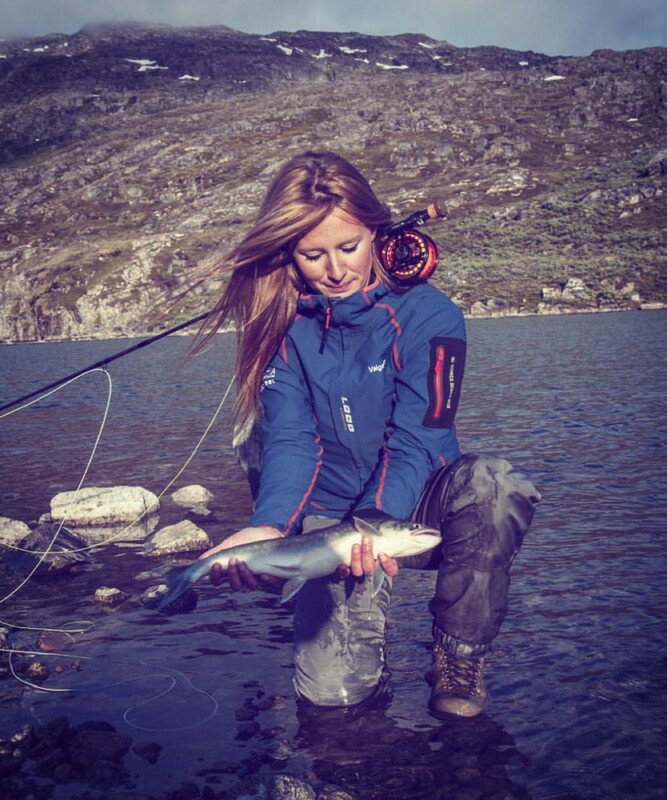 I was fishing with barbless hooks as it makes it so much easier to release them and less hurtful for the fish as it just pops out, it is of course easier to loose them as well so I was careful but I find it completely worth it and important when possible, in Greenland there was so much of char that I just looked at is as a little challenge for myself and was happy to see how easy it was to return them safely and easily back in. The following day we headed up to this beautiful river with a small waterfall, you could walk up the small waterfalls and see the fish lying in the smaller ponds there as the water was so crystal clear. Their beautiful colours got me watching them and taking photos and underwater videos forgetting about why I came there in the first place for a while…. Fishing yes, fishing! I set up my gear and swallowed a couple of mosquitos during, feeling accomplished of that precious mosquito spray I had brought along and sprayed some more on. Those little small successes along the way… really makes you want to high 5 yourself. 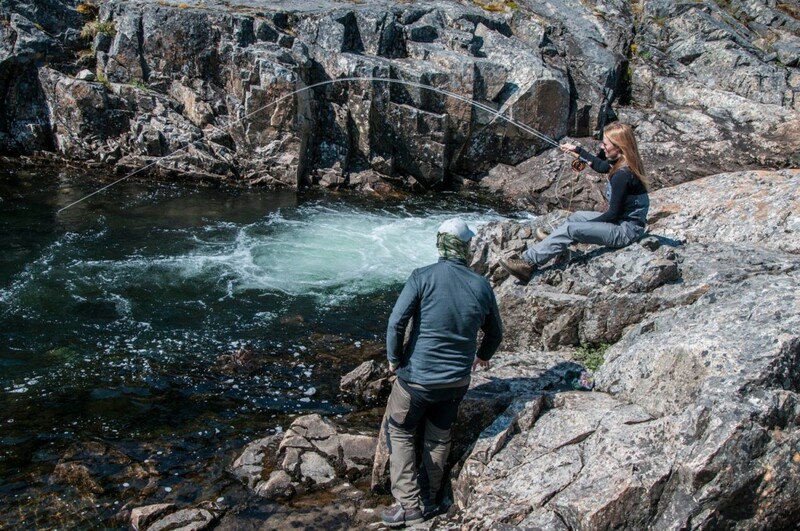 I started casting the gin clear water eying those big groups of char swimming by me driving me absolutely insane and wanting just to jump in and forget about the rod. Quickly but surely I had this beautiful char on the other end… I could see it clearly in the water fighting while I was reeling it in the whole way, this was amazing seeing the fishes every move and I got all the more excited. I was there with Simon and Bjork and there is nothing really like fishing with your friends and a good group of people sharing the journey. Bjork then caught her first fish and landed on the fly rod which was amazing to be apart of. “well you are a very lucky lady you see Vala, I am heavier then you are. If the polar bear will show up, he will catch me first giving you more time to run for it”. And that was that and along our way we saw the most fascinating footsteps Simon explained to us there was recently a big herd of reindeers here before us. I was fascinated how far my eye could see there was only us, there were no other people or houses, this was about as wild as it gets. In our time and age it is precious to get to a place that has not been occupied with technology and all that comes with it. McDonalds was about as far away and likely eying as meeting a polar bear strolling in Mall of America. How freeing and relaxing it felt. I fished a river there with gin clear water as before and walked up the whole river as far as I could get and looked behind every step and stone along my way. We got to this pool in front of a small waterfall and I honestly don’t know how it was possible for so many char to pile up there, I casted my fly and they fought for it, completely and eagerly jumping over each other to catch it like they knew before I was all for catch and release. Our last night came to an end back at the camp and I decided spending my last night before dinner fishing the home pool. When it was time to dinner I said to my cousin Id rather be fishing longer and didn’t really need to eat as it was only our last night and I wasn’t ready to stop. At that time I had completely forgotten about running into any polar bear. All I could think about was to keep going enjoying my last moments in this land of paradise. I arrived back home safe and sound with a little flu and a couple of mosquito bites, but most o f all, I arrived back home with another precious memory I will treasure for life and am thankful for travelling to Greenland and seeing it as it is now and enjoying it so untouched and unspoiled. I thought Greenland would be a destination to see once in your life but man was I wrong, I am heading back next summer 2016. If you want to join in on my trip next summer please send me a line via the contact form. 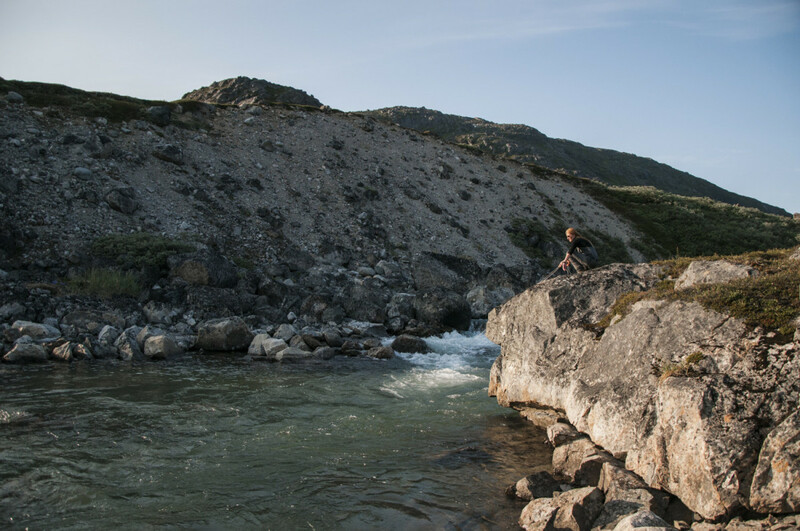 I look forward to creating more memories from Greenland.